Independent Security Advisors LLC is proud to announce the Maryland Police & Corrections Training Commission has approved three ISA programs of instruction for law enforcement. Each course to be approved must have a training commission vetted and accredited instructor and an approved syllabus with a clearly defined training objective. 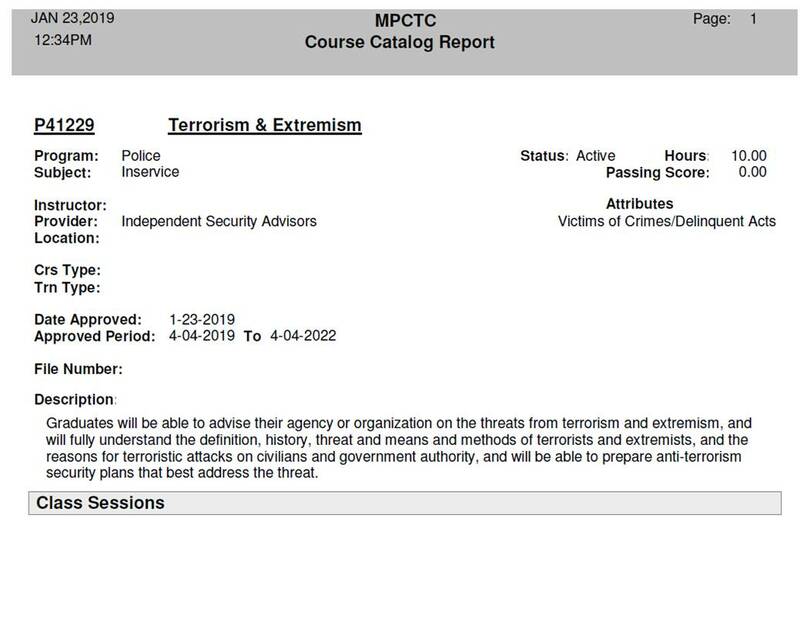 Instructors must have years of direct applicable operational experience in the topics or material they teach or they are not approved, and the courses can’t be conducted. Instructors must have a recorded evaluation at least twice a year by a third party and we are required to maintain those assessments on file for review. Any changes to the syllabus or curriculum must be submitted to the training commission for approval. Adhering to these standards authorizes ISA to conduct accredited training for law enforcement in Maryland and for those departments and agencies out of state that have reciprocity or credit agreements with the commission. We welcome the training commission’s audits of our classes and records and feel the efforts we take to have our programs vetted and approved by federal and state regulatory and law enforcement agencies, and by institutes of higher learning for educational credit is well worth the time and resources. For those attending ISA programs from the private security industry, this means graduating from a fully accredited course recognized by state and law enforcement agencies and receiving an educational transcript. Your graduation documents will have the official identification number of the course and hiring managers will be able to find your training on official state websites and verified by state officials. Ask your attorneys and insurance providers about the difference between having accredited training, and graduating something thrown together in a mini-mall when there is a complaint or lawsuit over the use of force for instance. Q&A What will the effect be on your job search prospects and contract proposals to a new client? Well, you can say I graduated from the ABC school of executive protection in Miami and hope they heard of it, or you can submit your certificate with the official stamp of approval of a fully state recognized and accredited dignitary and executive protection specialist training program.